LEXUS CT (CT200h) "CT" stands for "Creative Touring," and "200h" signifies a hybrid car with a power output equivalent to that of a 2-liter gasoline engine vehicle. LEXUS GS "GS" stands for "Grand Sedan." 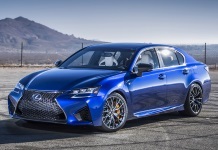 LEXUS IS "IS" stands for "Intelligent Sports (Sedan)." LEXUS HS "HS" stands for "Harmonious Sedan." LEXUS LFA The "A" in the name stands for "Apex" of the Lexus LF line of premium sports cars. LEXUS LS "LS" stands for "Luxury Sedan." LEXUS RX "RX" stands for "Radiant Crossover (X)." LEXUS SC "SC" stands for "Sports Coupe." Ами "ES" какъв седан ще е? The Machine написа: Ами "ES" какъв седан ще е? Е как какъв - елегантен!